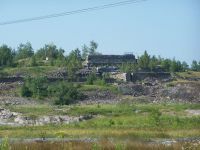 The foundation of the Nipissing low grade mill, standing atop Nip Hill on the east side of Cobalt Lake, is a prominent feature in town. Further, the mill is part of the Heritage Silver Trail, and the lookout built on top of the foundation affords one of the best views of the area. 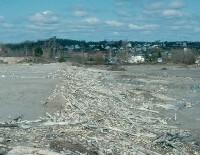 The mill burnt down in 1934, and over the years, debris has gradually been cleared from the site. However, there does not appear to have been any concerted effort to remediate the site. Data from the screen level health risk assessment completed by the Ontario Ministry of the Environment (2005) show that the soils around the foundation, as well as parts of the foundation itself, are high in arsenic, mercury and other metals. Thus, while progress has been made in cleaning this site, more work could be done to reduce exposures around the site. Environmental releases of contaminants from this site have not been assessed. 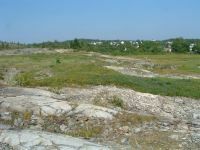 The tailings from the Nipissing low grade mill were deposited in a depression north of the mill, between the mill and Mill Creek. These tailings are one of the largest on land deposits of tailings in the Cobalt area. Comparison of a photo taken shortly after the mill burned down with recent views of the tailings suggest that as much as 50% of the tailings present in 1934 have been removed by erosion, and likely re-deposited in Mill Creek. 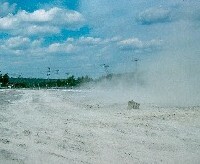 By the early 1990s the tailings were a wasteland. Erosion of tailings into Mill Creek was continuing, and the tailings were a significant source of arsenic into Mill Creek. 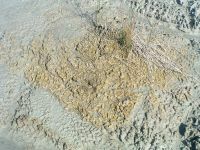 Extensive surface crusts formed in the dry summer months as a result of chemical reactions in the tailings. These crusts were water soluble and very high in arsenic. Heavy rains would dissolve these crusts, resulting in high concentrations of arsenic flushing into Mill Creek. In addition, dust laden with arsenic and other metals from the tailings was a potential hazard to those living near the tailings. In 1991 efforts were made to establish vegetation on a small area of the low grade tailings. This was likely intended to be an experiment, to test revegetation methods and different plant species. A test plot of about 100 by 50 metres was used. While some of the seeds planted did germinate, this experiment was largely unsuccessful, with all the plants which did germinate dying with a few weeks. In the late 1990s, the tailings were covered with about 30 cm of clay, and revegetated. The vegetation has taken hold across the tailings, and the difference is striking. The grey, dusty wasteland has been replaced by lush vegetation. Significantly, the successful revegetation of these tailings has largely eliminated the problem of dust from the tailings. This has helped reduce the potential risks to those living near these tailings. 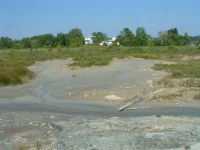 The revegetation has also reduced the recreational use of these tailings, particularly by youths in dirt bikes. Before revegetation, this recreational use contributed to the dust problems with these tailings, and may have put this riding at the tailings at significant risk from the dust due to the degree of exposure. Other improvements associated with revegetation are less certain. For example, a stream is still flowing along the east side of the tailings, and the erosion of tailings along the stream has been observed. Unfortunately, this stream was not diverted away from the tailings, and not until August of 2006 were efforts made to protect the tailings from erosion. At that time rock was added to the stream to prevent erosion. Further monitoring will be required to determine whether these efforts are sufficient to prevent further erosion of tailings. Unless further erosion can be prevented, the clay cover and vegetation will continue to slowly erode, returning extensive areas of the tailings to conditions like those before the revegetation. In addition, in areas where the tailings have been re-exposed as a result of this erosion, surface crusts are continuing to form on the tailings. 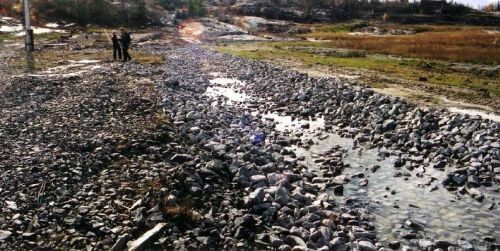 Thus, heavy rains may still result in the flushing of arsenic and other contaminants from the tailings into Mill Creek. 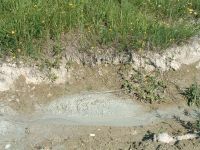 Extensive research into tailings reclamation in other areas in Canada over the last 25 years has demonstrated that a thin clay cover such as that used to cover the Nipissing low grade mill tailings is not sufficient to eliminate the chemical reactions which lead to the releases of most types of contaminants from tailings. At most sites in Canada, much more complex multi-layered covers, or water covers, are being used to cover tailings and prevent these sorts of reactions. This research and the cover methods that have been developed are well described in documents from the Mine Environment Neutral Drainage (MEND) program and many other Canadian and international sources. 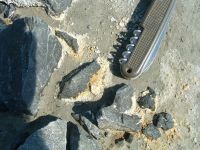 However, the unique mineralogical and chemical composition of the tailings in Cobalt means that this research and these cover methods are not necessarily directly applicable in Cobalt. Thus, it would be helpful to conduct monitoring to assess the current performance of the cover on the Nipissing low grade mill tailings, to determine if the chemical reactions that result in the release of arsenic from these tailings are still occurring. Further, water quality monitoring at the outlet from the tailings would help to determine if arsenic concentrations in water from the tailings are lower than concentrations that were reported before the tailings were revegetated. Based on this work, the adequacy of the current cover can be assessed. If the cover if not adequate, then further research could be conducted to identify a cover method that would be effective for these and other tailings in the Cobalt area. Another potential concern related to the Nipissing low grade mill tailings is the wood on the tailings and near the tailings. Three dams were built to contain these tailings. Examination of the remains of the largest of these dams suggest that it consisted of a core of wooden boxes, filled with sawdust and wood shavings, supported by a framework of larger timbers. After the mine ceased operations, these dams slowly deteriorated. By the early 1990s, large amounts of wood and other debris marked the location of this dam. When the tailings were revegetated some of this wood debris was removed, but much remains. 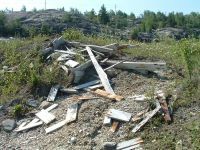 The concern with the wood debris at this and other sites in the Cobalt area is the risk that this wood contains arsenic and other contaminants. This wood has been exposed to the weather for almost 100 years, yet it is in excellent condition. Dovetails cut on the panels of the boxes in the dam still look sharp. 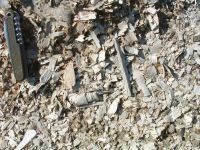 Sawdust and woodshavings on the surface of the tailings look like they came off a carpenter�s plane recently, not decades ago. One shaving in the picture on the right, taken in 2006, could even be uncurled, as if it was fresh from the carpenter's plane. Wood, sawdust and woodshavings exposed to all that Cobalt weather has to offer do not normally remain in such condition for 100 years. Chemical analysis would be needed to confirm this hypothesis, but it is probable that this wood contains high levels of arsenic as a result of decades of exposure to water containing arsenic. It is known that arsenic is a component, along with copper, in the chemical solutions that are used in the manufacture of pressure treated wood. It is possible that arsenic in the wood debris around this site and others in the Cobalt area has been preserved because of its high arsenic concentrations. If this is the case then the wood, like the tailings, could also be a source of arsenic releases to the environment. A more significant concern related to this wood is its possible use in campfires and bonfires. 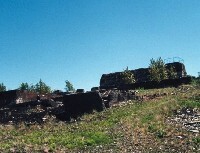 In the early 1990s, many pieces of charred wood were seen on the Nipissing low grade mill tailings and at other locations in the Cobalt area, such as the Crosswise Lake tailings. If this wood does contain arsenic, then the open burning of this wood, such as in bonfires, could result in high levels of arsenic in the smoke from these fires, posing a possible risk to those nearby. There are many uncertainties regarding wood debris in the Cobalt area, so the risks, if any, posed by this material, cannot be assessed at this time. Future monitoring in the Cobalt area should include an assessment of arsenic levels in this wood debris, and the potential risks, if any, associated with this wood. If the wood does contain arsenic, then it would have to be disposed of in an appropriate way. There is an interesting historical footnote to the question of possible arsenic in the wood debris around Cobalt. In describing the discovery of some of the veins on the Nipissing property, it was observed noted that some of the veins were marked by the occurrence of dead saplings which were described as being "mummified", and so brittle that "when stepped on they broke with a crack like a pistol shot". This description suggests that these saplings, like the wood from the dam, may perhaps have contained high levels of arsenic as a result of growing atop an arsenic-rich silver vein. Obviously, this can never be proven, but it provides a tantalizing piece of evidence to suggest that some arsenic contamination occurred naturally in the Cobalt area before mining began.